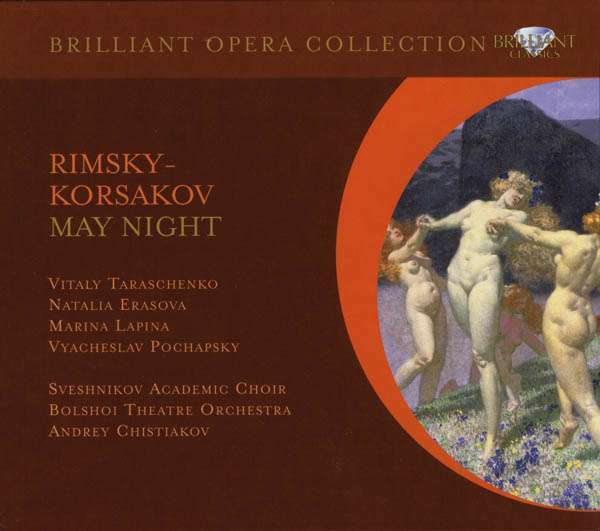 Nikolai Rimsky-Korsakov (1844-1908) composed his comic opera May Night in 1878-9, at a time when he was fascinated in the stories for the supernatural and the fantastic. It was also at this time that he had been appointed to a teaching role at the St Petersburg Conservatory -- a role he thought himself ill prepared for. Much to the astonishment of his fellow composers and friends -- Borodin, Balakirev, and Mussorgsky he threw himself in to the study of counterpoint, writing canons, fugues -- all far removed from the spirit of Russian Nationalism in music he and his friends had championed. To show that he hadn't deviated from the path of music inspired by Russian folklore and culture, May Night, his second opera is perhaps his most »Russian«. Based on a story by Nikolai Gogol, May Night, or the Drowned Maiden, Rimsky uses Gogol's story virtually unaltered, writing his own recitatives and some of the texts to arias. This adaption of ordinary speech or dialogue from the written story gave the work a colloquial folk like feel. Many of the tunes in the opera are from a collection published in 1872 by Alexander Rubets of Ukrainian folk songs. Rimsky's orchestration is superb -- glittering and highly illustrative of the supernatural realm of the »rusalki« and in places foreshadows the music Wagner wrote in act 2 of Parsifal for the depiction of Klingsor's Garden.